VietNamNet Bridge – Forest rangers on Con Dao Island, in the southern province of Ba Ria-Vung Tau, are familiar with a busy schedule because they not only patrol the forests, they also have to protect aquatic resources. The sky above Con Dao Island District has witnessed a number of whirlwinds, signalling the return of rough seas. Still, the work of rangers continues as normal. Con Dao National Park has a total natural area of nearly 20,000ha, including 5,990ha of forest and 14,000ha of water. The 60 forest rangers here are responsible for forest protection, marine conservation and protection of sovereignty. 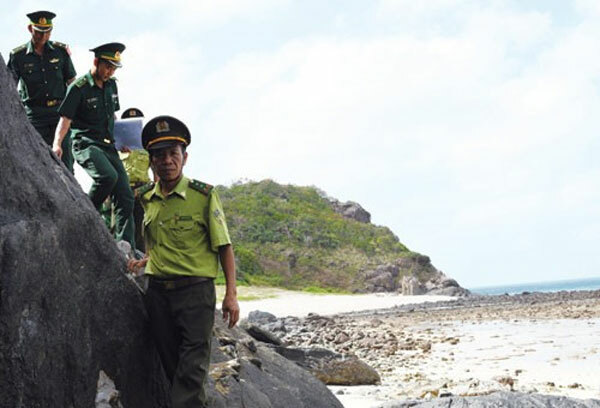 There were no forest violations and only nine sea violations reported in 2018, according to the Con Dao National Park’s management board. One day in early January, a flight from HCM City took a group of reporters from the Nông thôn ngày nay (Countryside Today) newspaper to Con Dao Island. During this season, according to local residents, only planes can take people to the island while passenger ships from the mainland to the island are cancelled because of the rough conditions. The first place the reporters visited was Con Dao National Park. Nguyen Khac Pho, director of Con Dao National Park’s Management Board, said the park was named and established under the then Prime Minister’s decision in March 1993. Before 1993, it was a wild forest. However, the first rangers arrived here immediately after the Southern liberation day (30 April, 1975). However, the work of Van Anh and 60 other rangers here is unlike that of forest rangers on the mainland. Con Dao park rangers were protecting the forest and patrolling the seas. We started taking part in a sea patrol with the mobile ranger team. Strong winds and 1.5m-high waves pounded the boat, but it could not prevent the rangers from starting their patrol. Nguyen Van Tra, deputy head of Con Dao National Park’s forest protection department, said besides the main island, there were 16 smaller islands. The nearest island was 4 nautical miles away, while the farthest was a few dozen nautical miles away. In order to protect forests and the sea, the national park has built ranger stations on these islands. Hon Tai (Tai Island) has an important ranger station that is responsible for protecting sea turtles and sea cucumbers, as well as a 34ha forest. It took us nearly 45 minutes by ship to get to Tai Island. Tran Van Binh, head of Tài Island’s ranger station, said: "When it comes to the stormy season, it takes nearly a month for the three rangers here to meet visitors." Three rangers including Bình are in charge of patrolling Tai Island and two small islands nearby. Ranger Tran Van Ninh said he has worked on Tai Island for three years. “When I first started working on the island, I felt very sad. "I missed my wife and children at home, sometimes I wanted to quit. However, we encourage ourselves and share joy and sorrow in life, we still stay with the island." Binh said the work of rangers here was quite hard and they often patrolled at night. “We have to protect two particularly rare animals: sea turtles and sea cucumbers, which are the most poached species,” he said. Con Dao District’s population is about 8,000, but it receives 25,000-26,000 tourists including 5,000-6,000 foreigners every year. With the belief that sea turtle eggs are beneficial to human health, and their high price of VND200,000/egg, many people still take the opportunity to steal them. Recently, people used boats to steal aquatic products in coastal areas. “Last month, we discovered some subjects were illegally fishing. We asked them to stop but they resisted by cursing, then throwing bricks and stones at the ranger’s boat. “Sometimes we have to leave, and ask for support from border military forces.